Or buy the CD, with the groovy booklet! Alex Shapiro has become one of the Pacific coast's most familiar composers of chamber music. Her name is synonymous with passionate music and a deep connection to the sea which surrounds her. Notes From the Kelp is a collection of eight of Alex's representative works. 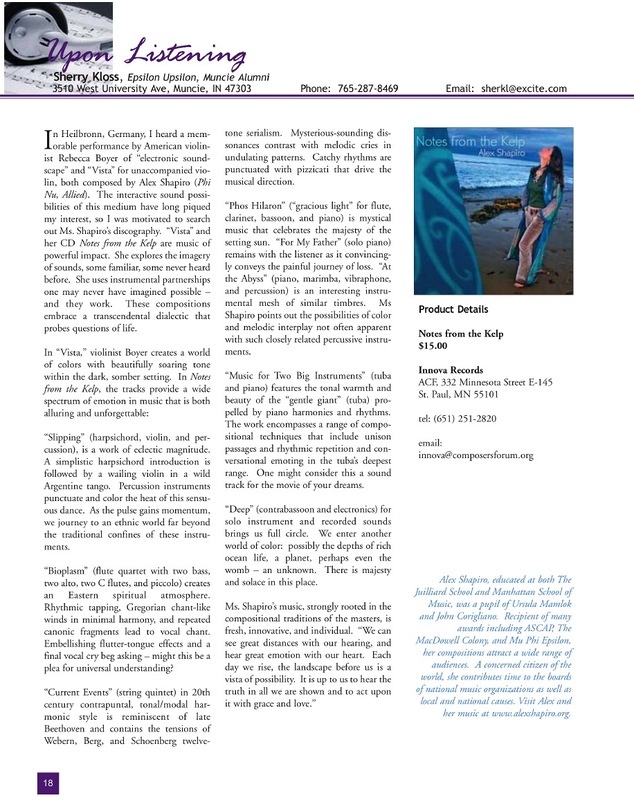 Scroll down this page to read about each of the pieces on the new disc and hear excerpts. Visit other pages of this website, linked above and below, to learn more about Alex's life and music. for violin, harpsichord, and percussion. for flute, clarinet, bassoon, and piano. for contrabassoon and prerecorded soundscape. "...flat-out fun... it's enough to give one hope for the contemporary music scene." "... [Shapiro] can write any kind of music she wants, and she writes only what she wants. Nowhere does one run across a hint of minimalist influence, or serialist, or neoclassic, or postmodernist, or jazz, or for that matter TV or film music. It's all just Alex Shapiro music..."
"[Alex Shapiro] is one of America's most interesting new composers... It takes a lot of courage to leave the window to your heart this open." "If one was forced to chose one adjective to characterize all these chamber works, that adjective would be, beautiful." "Considered as a whole, this outstanding recording presents an engaging collection of pieces that consistently demonstrate the composer's expert craftsmanship and clearly defined voice. Never rambling, Shapiro packs telling emotional explorations into concise formal structures that allow the audience to savor each moment. Notes from the Kelp is highly recommended not only as an enjoyable and varied listening experience, but also as a source of accessible and important new works by one of the most gifted composers active today. " "This inspiring recording is great to listen to regardless if one is a percussionist or not. But "At the Abyss" should be considered by any percussionists looking for great literature to perform." "Alex Shapiro’s music doesn’t need to be categorized; it should be listened to on its own terms." "a wide spectrum of emotion in music that is both alluring and unforgettable... music of powerful impact... [Shapiro] uses instrumental partnerships one may never have imagined possible – and they work. These compositions embrace a transcendental dialectic that probes questions of life." "...Ms. Shapiro handles a wide variety of instruments and idioms with style and expression... I am sure just about everyone will find something to like on the program." "Alex's architectural mastery comes into play... she does not waste notes. All are purposeful and directed... [her] work is notable. She handles each instrument as if it were her instrument. " "[Notes from the Kelp] is a brilliant new record. This is just such a beautiful new record: it's not just cute, it's not just charming and innovative, it's BEAUTIFUL." Listed on Robert Gable's blog aworks as one of his 10 Best CDs of 2007. 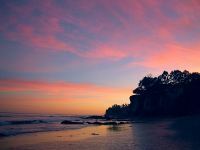 Enjoy a lovely article composer and guitarist Don Rath penned for his March 2010 blog. Can a composer be happy and live a balanced life filled with music, social activism and marine biology? Alex Shapiro gives us proof that such a beautiful existence is possible, and the sonic result spans an unusually wide swath of emotions. Shapiro's world is one of heart-wrenching lyricism and gut-wrenching demons. Whether her music is blatantly funny or stunningly introspective, it reaches out and attaches itself to the listener as a starfish might glom onto a rock. You won't want it to let go. Raw perception and truth are offered here, and Alex doesn't mince notes. Her rhythms and melodies may either make you reach for your psychiatrist's phone number, or a snorkel. If music mirrors a composer's personality, then you'll know a lot about this one through these diverse pieces. As you listen, like the kelp-rich tide pools encircling Alex's toes, this music will show you not only a glimpse of her world, but a reflection of yours. 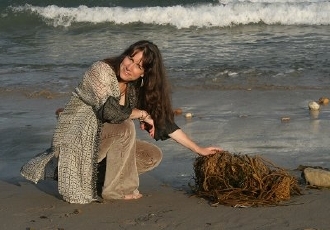 Alex is a seductive communicator, and "Notes from the Kelp" is a collection of chamber music representing a decade's worth of her passionate messages. Born and raised in Manhattan, she migrated to the Pacific Ocean many years ago and has never left. The eight works on this disc were composed in Malibu, California, and well-behaved muses now convene at her home in Washington's San Juan Islands. Alex's favorite way to procrastinate from writing the next piece has been to assist the next person. Throughout her composing career she's been an officer on the boards of numerous non-profit organizations ranging from the usual contemporary music suspects to the ACLU, and she's well known in sunny So Cal as an even sunnier host for new music events. 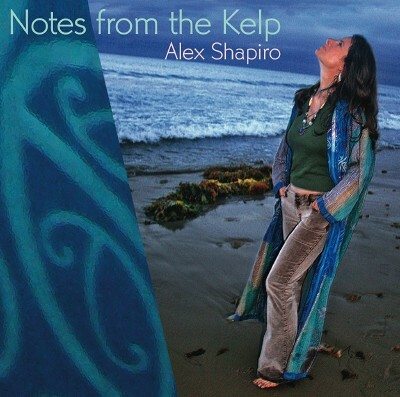 Alex Shapiro's music has been recorded for many commercially released CDs in the United States and in Europe, but "Notes from the Kelp" is the first album comprised entirely of her works. Hear Alex Shapiro's comments about several tracks from Notes from the Kelp, in response to questions from the producer of Behind the Beat, Steven Rosenfeld. The interview is featured on ASCAP Audio Portraits. Composing is a lot like making love. We're trying to please ourselves. We're hoping to please at least one other person. And, we are in fact, communicating. Notes from the Kelp represents a decade's worth of the joy I get from communicating. All of the music you hear in this collection was composed in Malibu, California, with the Pacific ocean undulating in the background and framing my life with beauty and endless things to explore. Immersed in the tides' shifting daily rhythms, when I'm not writing music I'm often in or on the water, communing with sea life and with my inner voices. And as you can hear in these pieces, there are a lot of diverse voices that keep me company! I suppose composing is a form of socially acceptable insanity. The variety of mood, sound and color in these tracks makes me smile. A wide swath of emotion and truth are offered here, from the silly and weird to the dark and introspective. If music mirrors a composer's personality, then you'll know a lot about me through these pieces. As you listen, my hope is that like tide pools, they show you not only a glimpse of my world, but a reflection of yours. 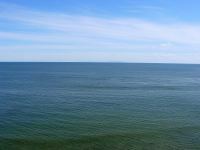 As you read this, I now live in another natural seaside paradise in Washington's magical San Juan Islands. The notes I scribble these days are also from the kelp, and from a deep, watery place that a kid who grew up in Manhattan for her first 21 years could never have imagined becoming so meaningful in her life. Cover art and above photos by Paul Chepikian. This recording showcases Alex Shapiro's eclectic style, and knowledge of her craft. "Notes from the Kelp" includes a spectrum of works with quite different "characters" and styles. 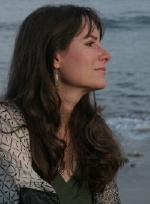 The recording showcases Ms. Shapiro's broad range of compositional ability. I think my favorite works on this CD are "Current Events" , and "At the Abyss" not only because the multiple movements cover such an emotional range but are still connected. I really like the beautiful melodies of "Phos Hilaron" and the pure, massive soundscape of "Deep". I'd love to hear the complete "Evensong Suite". I found "For My Father" both beautiful and poignant. I'm always impressed with the way some composers and writers can express deep personal feelings through their work, baring their souls, so to speak. Ms. Shapiro clearly has that ability. "Bioplasm" is a tour de force for flutes that works well and is impressively performed. Perhaps the most "unusual" piece on the recording is "Slipping" for violin and harpsichord. It clearly breaks any stereotypes one might have about "harpsichord music"! I love that the CD is bursting with so many great musical ideas! Listening to the samples will provide you with a small taste of Alex Shapiro's world. Buying the CD will give you a full helping. Highly recommended. Kathleen McIntosh and Robin Lorentz rehearsing Slip, discussing their upcoming Save the Trees campaign. 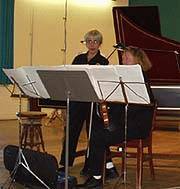 Starting off the CD is an unusual, comedic piece titled Slipping, a commission from violinist Robin Lorentz of the California EAR Unit for her duets with her recital partner, harpsichordist Kathleen McIntosh. The duet version of the piece, Slip, has become a standing ovation staple of the duo's concerts; using the harpsichord as any plectrum instrument other than a harpsichord, the music touches upon a wide range of global musical styles, and the result is a world tour for anyone with attention deficit disorder. For this recording, Alex added the talents of percussionist Dan Morris to heighten the effect with idiomatic drumming from around the globe. 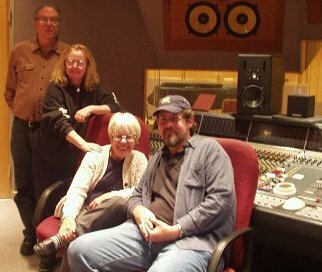 Pictured at left: Co-Producer John Steinmetz, Robin Lorentz, Kathleen McIntosh and engineer Mike Aarvold at Citrus Studios, January 2006. "I was quite taken aback and, of course, amused by Slipping... it's a lot of fun and quite unexpected. I can't think of any other recent work that does this." 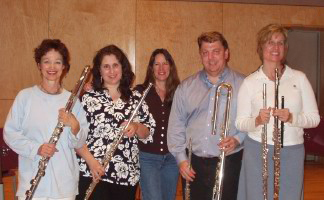 The Bioplasm recording session with The Los Angeles Flute Quartet at Citrus Studios 3/27/04. From left to right: Colleen Carroll, Lisa-Maree Amos, Alex Shapiro, Peter Sheridan, and Eileen Holt Helwig. Stretching the boundaries of flute quartet repertoire, Alex composed Bioplasm for the ever-daring Los Angeles Flute Quartet. The work was the result of Alex being named the 2004 California MTNA Commissioned Composer by the California Assn. 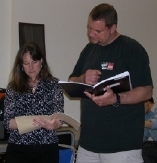 of Professional Music Teachers, and it won a 2005 award from the Music Teachers National Association. The piece, which includes two bass flutes, two alto flutes, two C flutes and a piccolo, is created with many extended techniques including percussive pitched key clicks, pitch bending, and vocalizing while playing, as can be heard in the audio excepts below. Bioplasm has been featured on many radio shows across the U.S., including WNYC-FM's New Sounds program, hosted by John Schaefer in New York City, and twice on KUSC-FM's classical music program, Modern Masterpieces, hosted by Alan Chapman in Los Angeles. "Perhaps my favorite piece for listening is Bioplasm... it doesn't make experimentation into hard work... Bioplasm approaches the music with (dare I say it) a film composer's ear. In other words, I am not conscious of the music so much as the sensation." "[Bioplasm] was a particular favorite, receiving strong gusts of applause and even shouts of approval. As such, it was a well chosen finale, sending the audience home in an elated mood." This recording appears on the Los Angeles Flute Quartet's 2005 CD on LAFQ Records, Above and Beyond. The Current Events recording session at Citrus Studios 6/14/03. From left to right: Miwako Watanabe, Connie Kupka, violins; engineer Rich Breen; Alex Shapiro; David Speltz, cello; John Steinmetz, co-producer; David Walther, Victoria Miskolczy, violas. One of Alex's larger chamber works is her string quintet, Current Events, commissioned by the Pacific Serenades concert series in Los Angeles. The piece was premiered in Los Angeles March 2003 by the same musicians who then recorded it that June, and the Pacific Serenades season during which it appeared was awarded First Prize in the Chamber Music America/ASCAP 2004 Award for Adventurous Programming. Each of the three movements, Surge, Ebb and Rip, ponders the ocean's tides as well as the waves of a more internal, emotional nature. The piece has enjoyed widespread airplay on over a hundred NPR stations across the U.S., and has been performed by a wide variety of ensembles. It’s music exceptionally well made... I found it most attractive, especially in a long, beautifully unfolding slow movement. "The centerpiece of Notes from the Kelp (for us, at any rate) is Current Events... richly dissonant and dark-textured; a dense polytonal chromaticism that’s gorgeously and unabashedly romantic and deeply affecting. If there’s but one work on this CD that all will love, this is it, and were it the only work on the CD, it alone would justify the purchase price." 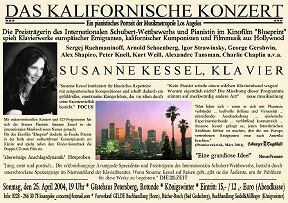 German pianist Susanne Kessel created a unique concert program for a WDR radio production in Germany, featuring short solo piano pieces by numerous composers with immigrant backgrounds who were influenced by their time in California. Kessel also toured with the program in Germany, where she performed on the "New York's MoMA in Berlin: The American Season" special exhibit series, and in Bonn on the annual BeethovenFest series. Along side of Schoenberg, Stravinsky and Gershwin, Kessel chose only two pieces from living California composers, one of which was For My Father, a movement from Alex's Piano Suite. "The most serious work on the album, the solo-piano For My Father, depicts the descent into dementia of the composer's father; here again Shapiro is both emotionally immediate and capable of sustaining a structural process over a long stretch." Ms. Kessel recorded For My Father for her 2006 CD for the OehmsClassics/WDR label, Californian Concert: Music of European Immigrants and Their American Contemporaries. At the Abyss, a dramatic, tour de force three movement work for piano, marimba, vibraphone and metal percussion is the winner of the 2003 Best Original Composition Award from the international music fraternity Mu Phi Epsilon. The music was commissioned by pianist Teresa McCollough for her 2003-2004 U.S. tour, which brought the piece to Carnegie Hall in April 2004. "This is music that conjures images in the mind, and the joy of it all is that those images will vary from listener to listener." At the Abyss also appears on Teresa McCollough's CD for Innova Recordings, Music for Hammers & Sticks. Joining Teresa on the CD are percussionists Tom Burritt and Peggy Benkeser. In 1999, Alex was commissioned to compose the music for an Evensong service for St. Bede's Episcopal Church in Los Angeles. Of the six movements of a resulting work titled Evensong Suite, Alex's favorite is the Phos Hilaron, referring to "gracious light." It is included on the CD, performed by flutist Brice Martin, clarinetist Charles Boito, bassoonist Carolyn Beck and pianist and St. Bede's music director Frank Basile. "...subdued in full-frontal music-ness... it's expressed beautifully. " 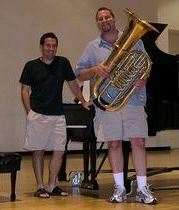 Also appearing on the CD is Alex's popular duet for tuba and piano entitled Music for Two Big Instruments, commissioned by Los Angeles Philharmonic principal tubist Norman Pearson and pianist Cynthia Bauhof-Williams and recorded by New York Philharmonic principal tubist Alan Baer, and pianist Bradley Haag. The piece expands audience's popular perception of traditional tuba music by offering soaring, lyrical melodic lines, as well as a few faster-than-often-thought-possible passages. "Music for Two Big Instruments is brilliantly crafted. It takes commitment to be other than clever, and Alex has it. She treats the tuba exactly like a French horn with an extended lower range, but takes advantage of its power without losing lyricism." 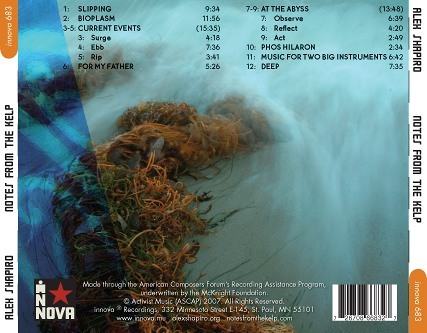 "Alex Shapiro’s Music for Two Big Instruments, written for Norm Pearson (tuba player with the Los Angeles Philharmonic)... is a very powerful piece..."
Deep is the only electro-acoustic piece featured on Notes from the Kelp, and it is the final track on the CD. Alex created an electronic soundscape that submerges listeners in an other-worldly realm, and contrabassoonist Leslie Lashinsky raises notes from the depths of her instrument to transport the piece to an entirely different sonic place than everything which precedes it on the disc. Deep prepares the way for the opening movement, Depth, from Alex's 2011 wind symphony to the sea, Immersion. 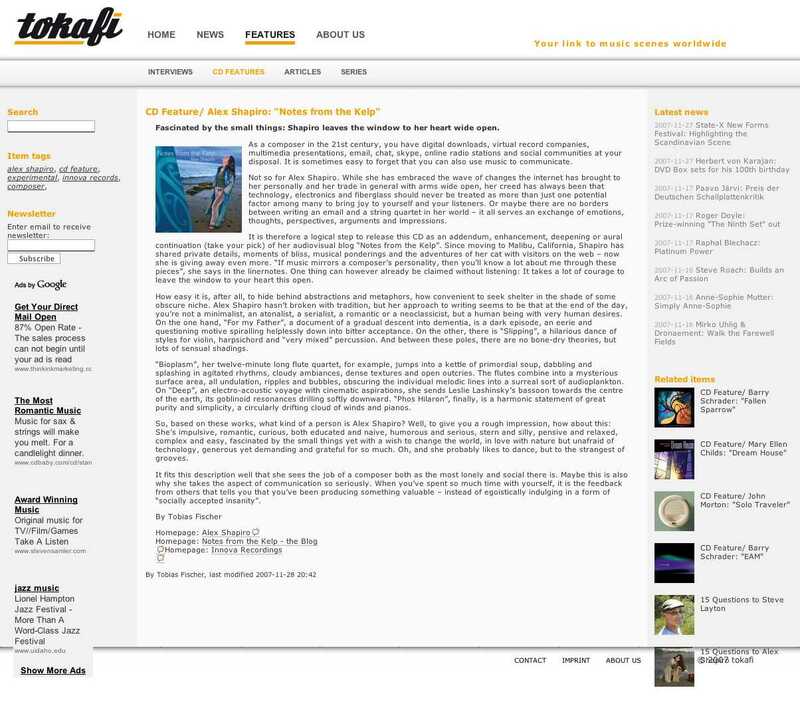 "... the most effective piece for contrabassoon and accompaniment I have yet heard.... Shapiro's sound track embraces the listener and creates vivid images of the unique beauty and tranquility of the sea floor." -"...the contrabassoon emerges from a pre-recorded track of electronics evoking the bottom of the sea. The blend of sonorities is ominous and magical." Deep also appears on bassoonist Carolyn Beck's CD for Crystal Records, Beck and Call, along with Alex's bassoon sonata commissioned by Carolyn, titled Of Breath and Touch. Deep has also been recorded on bassoon and appears on bassoonist Cayla Bellamy's 2018 CD, Double or Nothing. Your contact information will not be shared with anyone for any reason. Alex Shapiro loves to hear from people. You're invited to email her and she will respond as soon as her feet dry off.